While banning might be a good idea for the “sit, listen, discuss, repeat” style of teaching, for the rest of us, not so much. 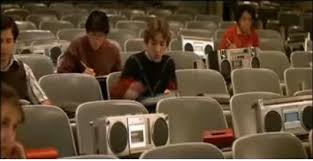 The disengaged classroom Shirky describes brings to mind the scene from the 1985 comedy “Real Genius” where eventually most every desk had a tape recorder and eventually the professor also gives in and replaces himself with a reel to reel to deliver his lecture. But is this really a problem with "kids today?" Shirky admits that he uses largely the same topics and roughly the same criteria year after year. That’s part of the problem. When you repeat the same class year after year, it becomes a bit like a worn out outfit. The newness and excitement are gone. Today’s students not only want, they demand an update. While banning is the easy way out, we certainly can do better. In classes where teachers do better students are not just listening, talking, and being tested on stuff, they’re actually “doing stuff.” This is where technology can fit in beautifully. Technology allows us to develop our own personal learning networks which enable us to learn and grow in ways never before possible. Beyond a personal learning network, there is just a LOT that we DO on computers. For example, in one of my classes, participants were learning to create digital portfolios with EduClipper. We had some questions about the platform, tweeted Adam Bellow, the creator of EduClipper, then used Google Hangout to discuss some of the intricacies of the platform. In another class we discussed the importance of online reputations. Students made videos describing how they wanted to be represented online. The videos were then shared on a Padlet and we had a viewing party. Shirky’s article continues by pointing to research about the negative effects of multitasking. Once you scratch beneath the headlines, you realize these studies are flawed. They measure multitasking by creating an artificial environment where the tasking is done “to” rather than “by” the subjects in the study. Educator, Ira Socol elaborates on their fatal research mistakes here among other things pointing out the absurdity of measuring nonsense tasks. Shirky tells us all this multitasking that occurs on devices distracts students from the learning he is trying to impart upon them. Can laptops be a distraction to lectures and discussion? Sure. However, imagine the student in the back of the room, legs up with a favorite newspaper, magazine, or book, placed in front of their face. This of course is also a distraction, but would we wouldn’t ban reading material from classroom. We would address the the rudeness and lack of interest. Laptops, newspapers, magazines, books, or even the person sitting next to you can be a great distraction, but you know what? They can also be amazing tools of engagement. Turn and talk. Let’s discuss that passage in the magazine or current event in the newspaper. Discuss these topics via social media, and have these conversations with the world. Shirky is blaming the technology, rather than figuring out what HE can do better as an educator in the digital age. In eliminating what he perceives as the problem - “technology,” he is not addressing the real problem - “students aren’t focusing on him.” This is something worth discussing. Why aren’t they focusing? Is it lack of interest? Inability to sit and listen to a lecture? Are they bored? Shirky can “discuss with” rather than “take from” students. Shirky sees teaching as a “shared struggle.” If it is shared, why is he dictating what they are doing? While it may be easier to ban students from the ability to use digital devices, innovative educators know how to use these devices to engage their audiences. They know how to turn traditional delivery into one that is as interesting and interactive. (You can read five ways to do that here). They know how to manage a digital classroom. They give lots of opportunities for activities like turn and talk. There are random number generators for sharing. There is polling. And, one of my favorites: peer instruction. Depending on the length of the class, there may also be a break built in to the class time, where engaging in personal business is fine. Shirky is an ironic case because he is a professor of media studies, yet it seems his students have used that very platform to tune him out leaving him grasping for straws when it comes to figuring out how to get his connected students to tune in. It’s not surprising. Shirky is an expert in media studies, yet he’s never been trained as a teacher. Even if he had, sadly most teacher education programs are still preparing teachers for the classrooms of the past. Classrooms where the teacher and teacher’s guide were the gatekeepers to all students needed to know and technology was a fountain pen or maybe a calculator.Times are a changin. It’s time for an update Professor Shirky. You’re teaching the same topics year after year and it shows. Don’t ban devices. Get in touch with students. Talk to them. You may find they no longer want the same topics with the same criteria, measured by testing, rather than doing, every year. They know that no one needs to come to class anymore to hear you lecture. Use your time more effectively. Let them watch the lecture on their own. Incorporate best teaching practices such as frame, focus, follow up. Save class time for doing hands on, meaningful work. When you do, technology becomes “a part of” rather than “apart from” powerful learning experiences in the classroom.